Dark matter dominates the Universe around us, far exceeding the amount of everyday baryonic matter that makes up humans, the Earth, and the entire visible Milky Way. Our galaxy is embedded in an invisible cloud of dark matter, which contains smaller dark matter clouds that orbit around us like satellites. These satellites do not contain big spiral galaxies like the Milky Way and, although they may contain smaller galaxies, they are made up of almost entirely dark matter, which means that they are very sensitive to the precise nature of the dark matter particle. Today’s paper investigates whether two of the Milky Way’s largest satellite galaxies (Fornax and Sculptor, Figure 1) conflict with the leading theory of Cold Dark Matter (CDM), potentially requiring a complete reconsideration of our understanding of the evolution of the Universe. Don’t get too excited, though. I will break the suspense and say that, as usual, the answer is “not yet” – we don’t know enough about these mini galaxies to throw away CDM. There is still a lot of work to be done if we want to break this paradigm. The cusp-core problem has come up over and over again, but so far we have always been able to find an explanation for unexpected dark matter shapes – usually related to the fact that galaxies, even satellite galaxies, are not 100% dark matter. They are actually really complicated systems with stars forming, supernovae exploding, and sometimes even galaxies colliding. However, if we could rule out all of these alternative explanations and we were still left with dark matter cores, we would know that something was up. CDM on its own cannot produce this shape. Therefore, although it is exceedingly difficult to conclusively say that exotic dark matter physics is the only remaining explanation, until we actually directly detect dark matter this is an important study of the true nature of these mysterious particles. In order to do this, we need to be sure of when we are actually observing these cores and when we are not. This is where today’s paper comes in. Anna Genina and her collaborators use simulations to challenge the claim that Fornax and Sculptor contain dark matter cores. The simulations include baryonic physics like star formation in addition to dark matter, in order to reproduce real-life observations as closely as possible. Dark matter is invisible, of course, so the shape of a dark matter distribution must be indirectly observed through the distribution of stars or gas. To look at the dark matter distribution in Fornax and Sculptor, previous observations measured the mass of two different stellar populations in each galaxy. These two populations have different radii and can be used to infer the underlying shape of the dark matter in the galaxies. This requires some assumptions about the observed stellar populations, including the simple assumption that they are perfectly spherical. The authors find that realistic simulations of galaxies like Fornax and Sculptor around galaxies like the Milky Way are not so simple. Many simulated galaxies end up with two stellar populations, but these populations are often not spherical – they are elongated and rotated so that the two populations are not only aspherical, but they are also aspherical in different ways, further complicating the observation. The authors modeled observations of these simulated galaxies to see whether the simplifications used in the observations of Fornax and Sculptor could lead to falsely observed cores. The simple answer is “yes” – it is entirely possible that ignoring the complex distribution of the observed stellar populations can lead to the observation of a core when the underlying dark matter distribution is actually a cusp. 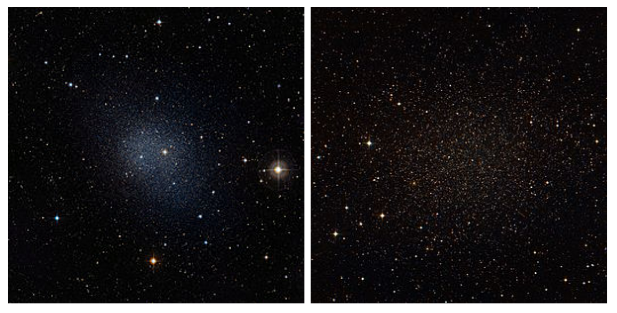 Furthermore, when the same galaxy is observed from different angles, the inferred shape can change! 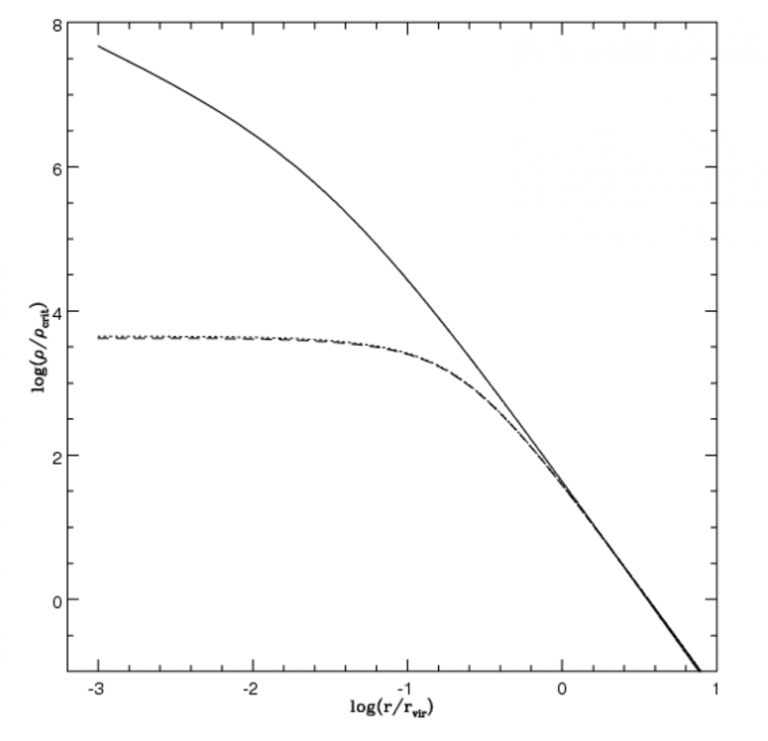 Figure 3 illustrates the results of the paper. The authors used the two methods of the previous Fornax and Sculptor observations to model measurements of the slope of the dark matter profile (Γ) in their simulated galaxies. Γ = 2 corresponds to a cusp and Γ > 2 corresponds to a flatter, more cored profile. The pink shaded region is the probability of a cusp being mistaken as flatter than it truly is. For the first method (left panel), the probability is 26.3%, and for the second (right panel), it is 13.6%. Both of these numbers are large enough to bring into question the actual shape of Fornax and Sculptor! This shows that we have to be extremely careful when drawing conclusions about the nature of dark matter from observations of galaxies. It is not only difficult to conclude that observed dark matter cores could only be formed by exotic dark matter physics, it’s also very difficult to confirm that dark matter cores even exist in the first place. This may sound discouraging, but actually, studies like this do not take us farther from being able to constrain dark matter physics. In fact, they bring us closer by clearing up uncertainties and erasing false signals, thereby revealing the path to uncovering the true nature of dark matter. There is evidence of the superfluid dark matter every time a double slit experiment is performed, it’s what waves.